Earl Sweatshirt created a moment during his performance in Denver’s Cervantes on Thursday night. After his three-year hiatus, the 25-year-old Thebe Kgositsile (i.e. 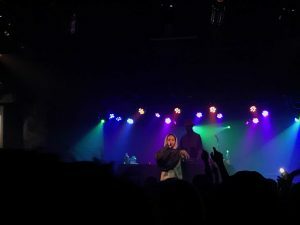 Earl Sweatshirt) came out with his third studio album “Some Rap Songs,” which led him to a headlining tour that traveled through the mile-high city this past Thursday. 2018 was filled with turmoil for this young rap star. From losing his father, his uncle and frequent collaborator Mac Miller, it was a year marked with loss and pain. “Why ain’t nobody tell me I was sinking? Ain’t nobody tell me I could leave?” are a few lines to kick-off his album alluding to the inner turmoil Kgositsile’s been facing since he made his debut in the music industry at 19. Earl, being one of the most bone-chillingly truthful rappers and talented producers, came out in an attire the only way someone should expect him, a grey hoodie, grey Nike sweats, some pearly Nike Air Force Ones and a black jacket over the top. Unlike many artists, instead of hiding in the back until it was his set, Earl was grooving with his opening acts Liv.E and Bbymutha throughout both of their sets and hopping on stage with them from time to time. The crowd’s energy was vivacious and all of the performers were feeding off of it. Earl kicked off his set with the song Molasses from his 2013 album “Doris,” giving a little bit of a throwback bone to the crowd. At one point, Earl decided to ditch one of the arms from his black jacket, yet choose to still keep the rest of it on like the fashion icon he is. Some of the highlights from the concert were “December 24,” “Pre,” Nowhere2go,” “Grief” and “Quest/Power” playing an arrange of his discography. The atmosphere of the crowd was volatile. One moment there would be a mosh-pit and the song after that people would be in their feelings vibing out. Earl is one of the most intrapersonal rappers in the game. Choosing to appear more relatable than superficial as some rappers choose to flaunt their wealth his stage persona was extremely reserved. The last couple of songs were DJ’ed as Earl brought his friends back up on the stage to join him and close out the night. It may not have been a club banging night, but Earl put one of the best rap shows Cervantes has hosted in a while. “That was probably the best concert I’ve been to so I’m looking forward to this one,” said Earl, a college student from Washington DC who came to see the show.